A-n-t-i-c-i-p-a-t-i-o-n can be a wonderful thing! The months and weeks leading up to the big day were filled with excitement and making plans. 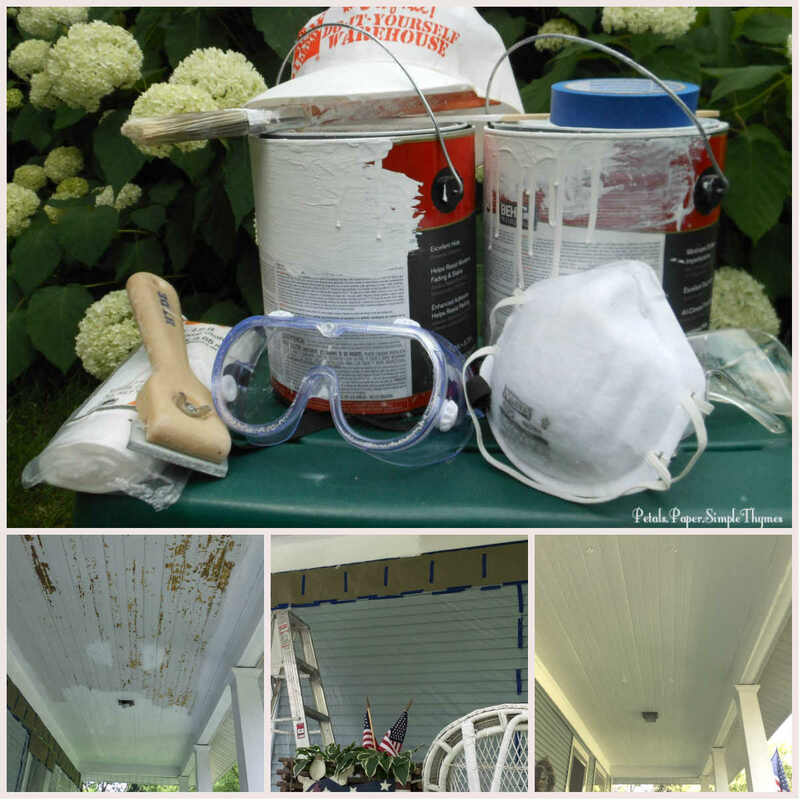 When September finally arrived, it was time to prepare a cozy, welcoming guest room for our very special friend. 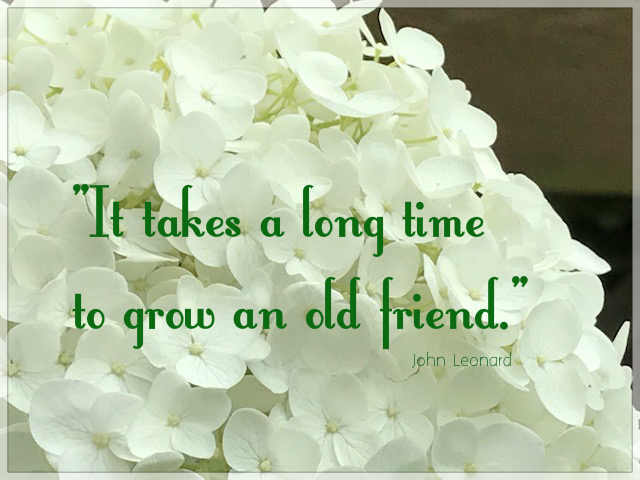 The seeds of our very special friendship were sown 39 years ago. My Uncle Bill (who had moved to Germany, after serving in Vietnam) knew that his co-worker and friend would be passing through Chicago on a tour with her parents. He asked Iris to bring a packet of photos for us. We were so grateful for her kindness! So, my mother, my brother, and I met Iris and her parents at the Blackstone Hotel on a Sunday afternoon, in March. It was a day that would change lives forever! Our friendship began to blossom as Iris became a special part of our family and my circle of friends. 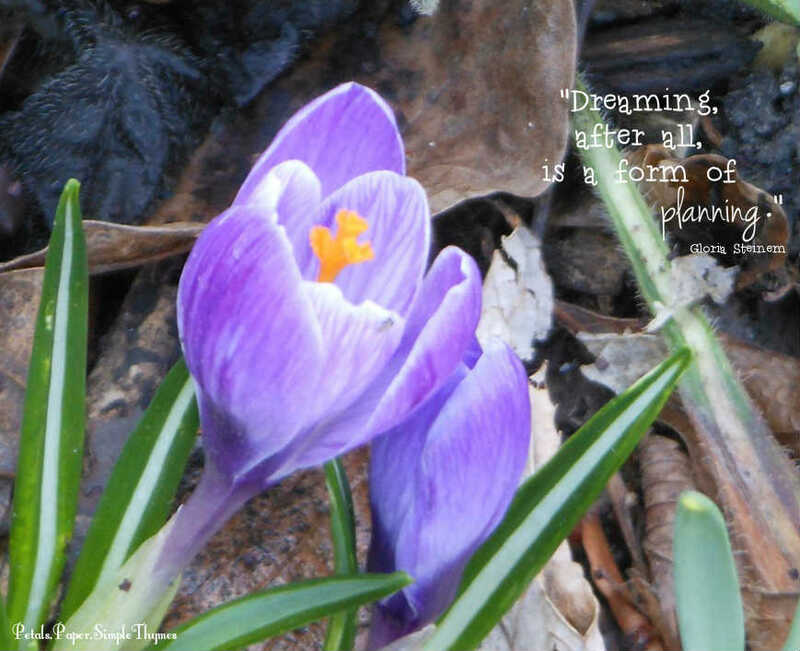 My teaching career was just beginning and my dreams were just beginning to come true! The following summer, I went to visit Iris for several weeks. She lives in a beautiful city in southwest Germany, near the Black Forest. 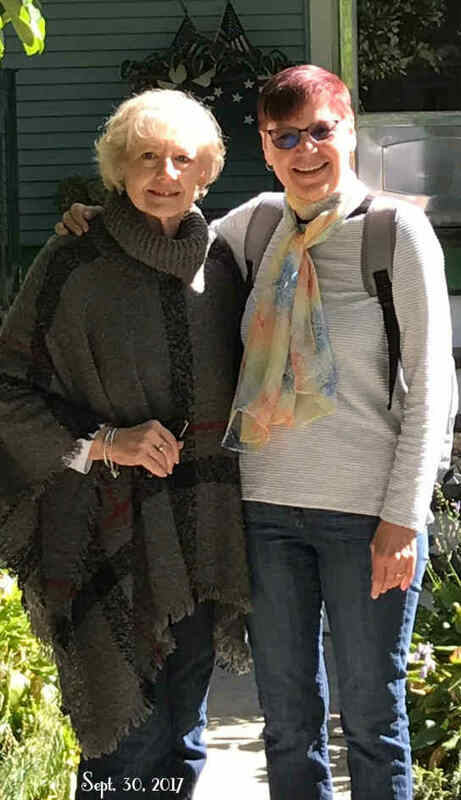 I felt so blessed to be welcomed into her family and her circle of friends during that wonderful summer in 1979. Our special friendship has flourished as three decades have passed. Since we were both single, footloose, and fancy-free, we were so fortunate to share our travel dreams together. Iris often came to visit me (during the even-numbered years) and I often visited her (during the odd-numbered years). Oh, the exciting adventures we have had together!! Both of our lives have grown busier over the past several years. Yet, Iris and I have always kept one another very close at heart. 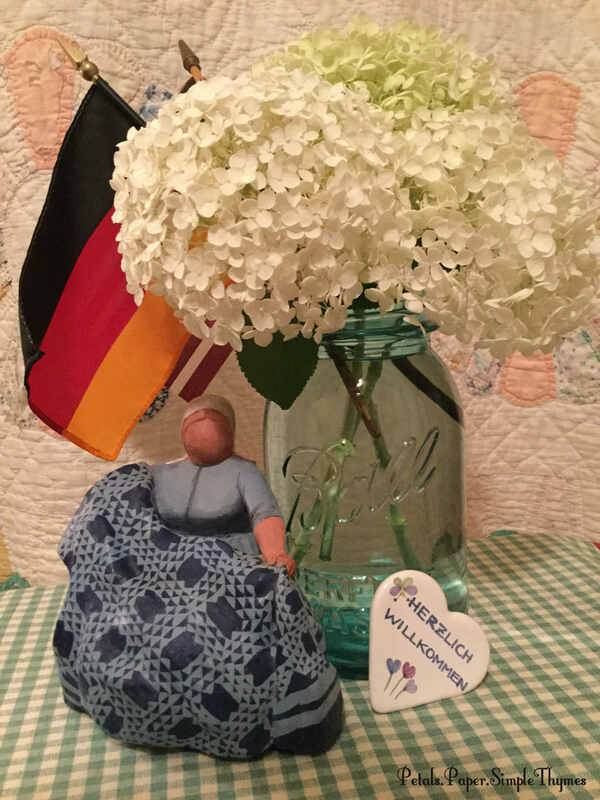 I was so excited to introduce my husband to Iris (and all of my German family and friends), when we visited Germany five years ago to celebrate my Renaissance (the ‘R’ word that I use for Retirement)! True friends, together again! 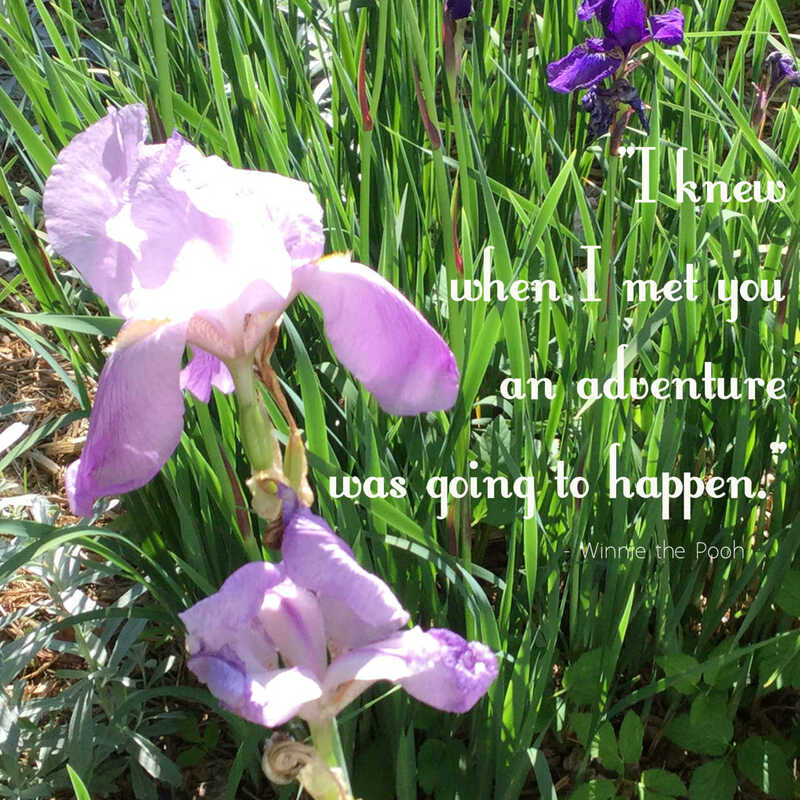 Over the years, I have always grown Irises in my Friendship Garden, as I dreamed of another visit with my perennial friend. I carefully tended the yellow and purple blossoms as our friendship continued to grow and blossom. Can you imagine the happiness that we all felt as we awaited a mid-September visit from our dear friend, Iris? 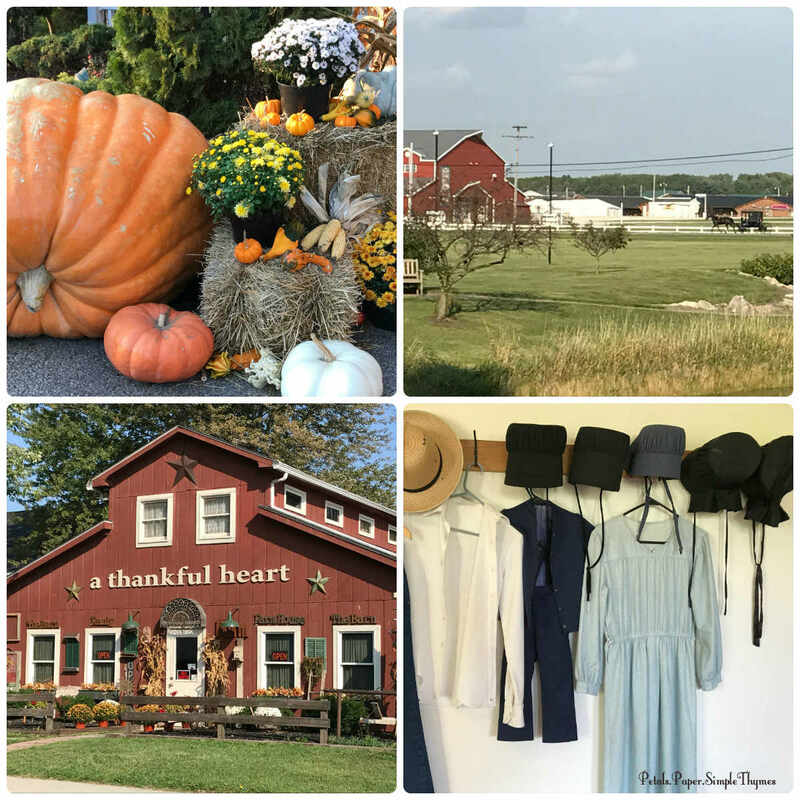 We welcomed Autumn with a visit to Amish country in Northern Indiana. 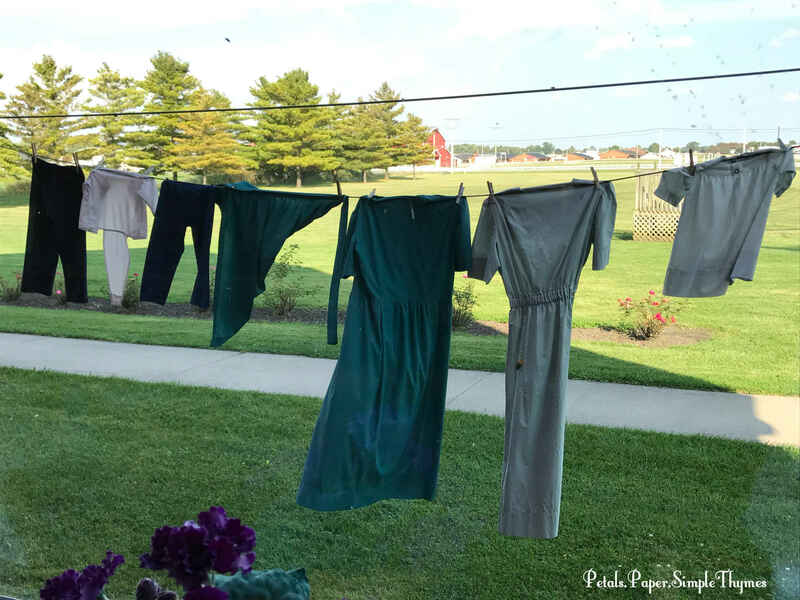 Iris and I have always loved exploring the peaceful countryside near Shipshewana and Middlebury and the clip-clop sounds of the Amish horse and buggies. 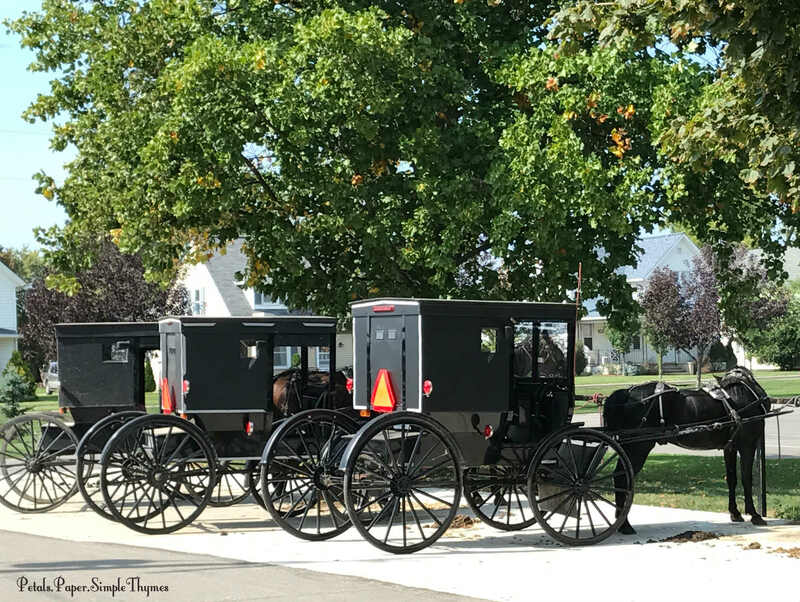 My husband was fascinated by his first visit to Amish country. 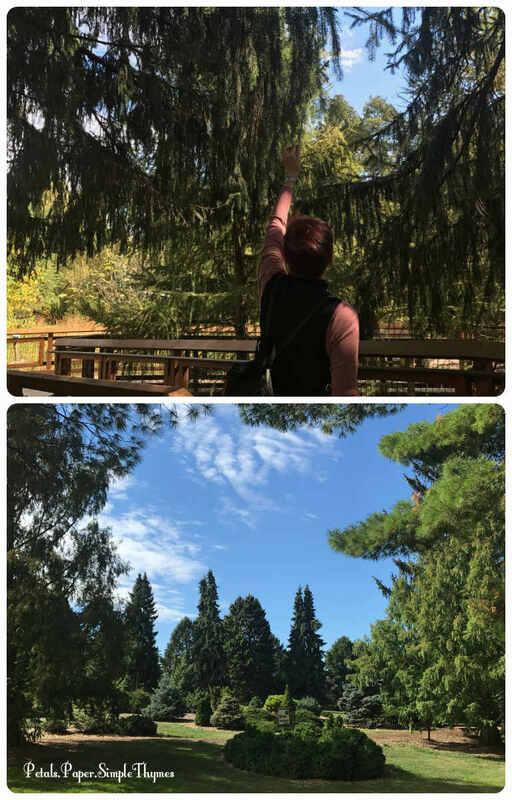 Signs of Autumn were everywhere, while Summer-like temperatures soared to the mid-90s (twenty-five degrees above normal!). We admired beautiful Amish quilts and handmade furniture and were tempted by yummy baked goods and preserves. We learned a great deal about the history of the Amish and Mennonite people from the interesting tour guides and multi-media presentations at the Menno-Hof . Everywhere we went, the Amish people were eager to speak German (their first language) with Iris. We spent our second day exploring the small town of Middlebury, Indiana. 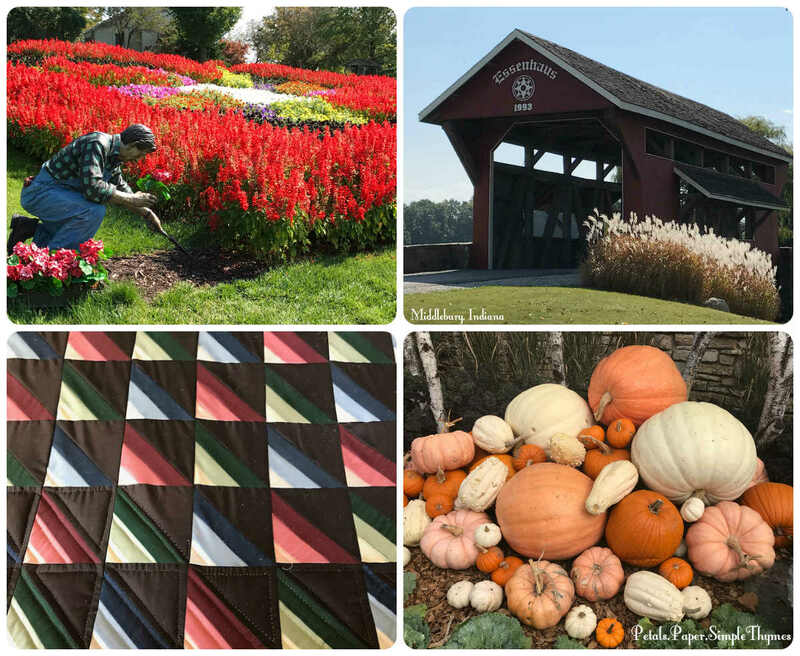 We enjoyed a colorful quilt shop and a beautiful Quilt Garden. Iris visited her first covered bridge. 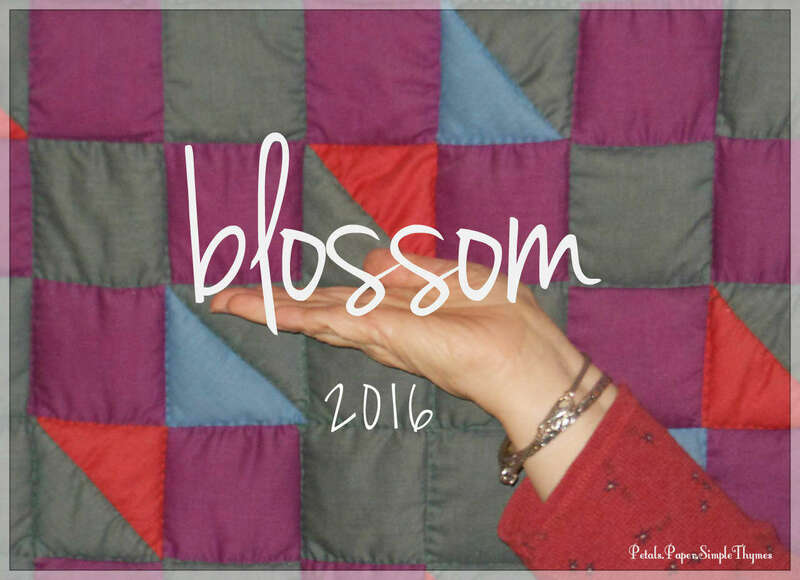 I will always remember our visits to an Amish home and farmstead to admire their handmade quilts. My husband and I look forward to visiting other Amish communities in the future. Iris and I promised to carry the tranquil clip-clop sound of the horse and buggies with us when life returns to its usual busyness. 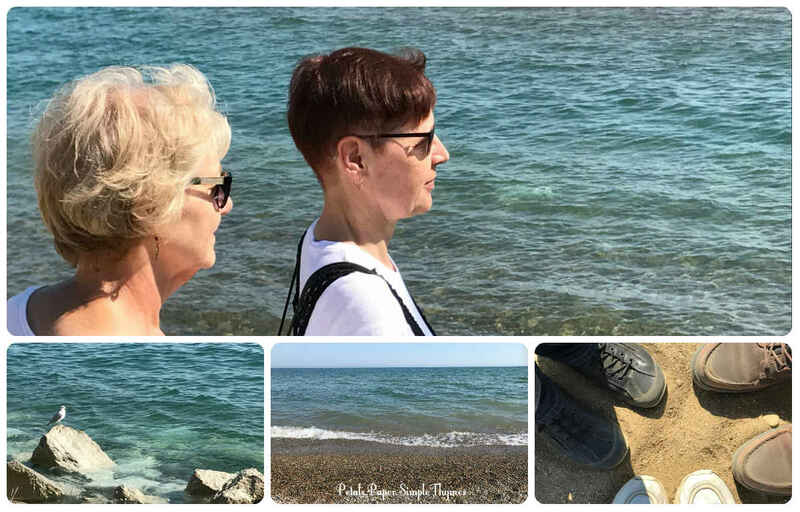 The next day, we cooled off with a peaceful walk along the beaches of Lake Michigan, at Illinois Beach State Park. Lake Michigan is one of the five Great Lakes. Its name comes from the Ojibwe word “michi-gami” (meaning ‘great water’). During past visits, we have enjoyed sailing on Lake Michigan with dear friends! We thrive on new experiences! So, Iris sat in a sporty, red Tesla and learned all about it. She always dreamed of sitting on a Harley. So, we wandered through the Harley-Davidson dealership as a friendly salesperson answered all of our questions. For a new taste treat, Iris enjoyed her first burrito! We squeezed many new adventures into our time together. 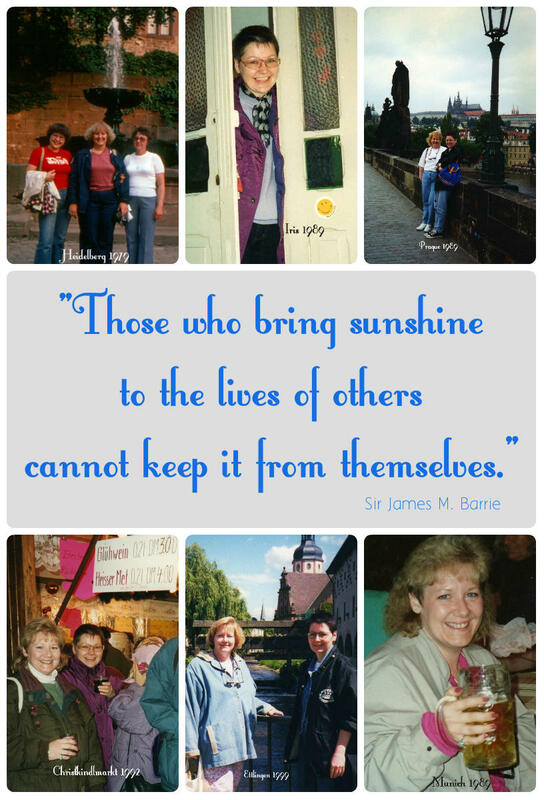 I will always cherish our times reminiscing (and laughing) about our adventures over the past 39 years. 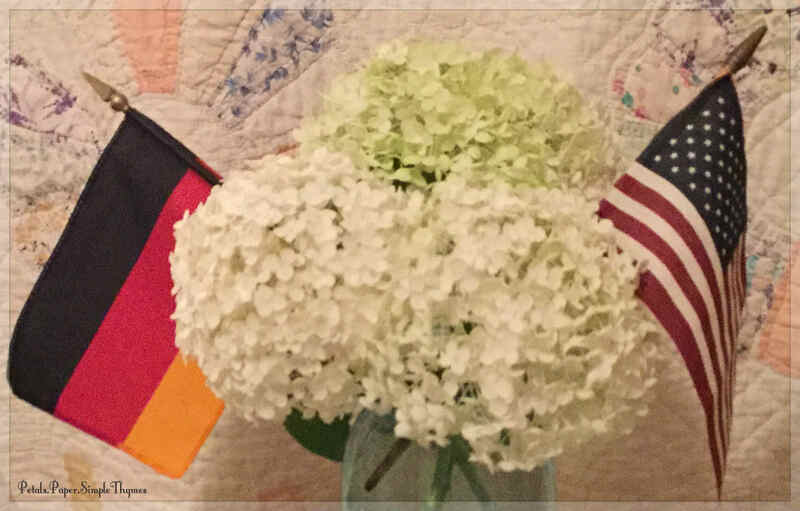 What fun to look through photo albums filled with happy memories of our times together in Germany (and so many places in Europe) and America! 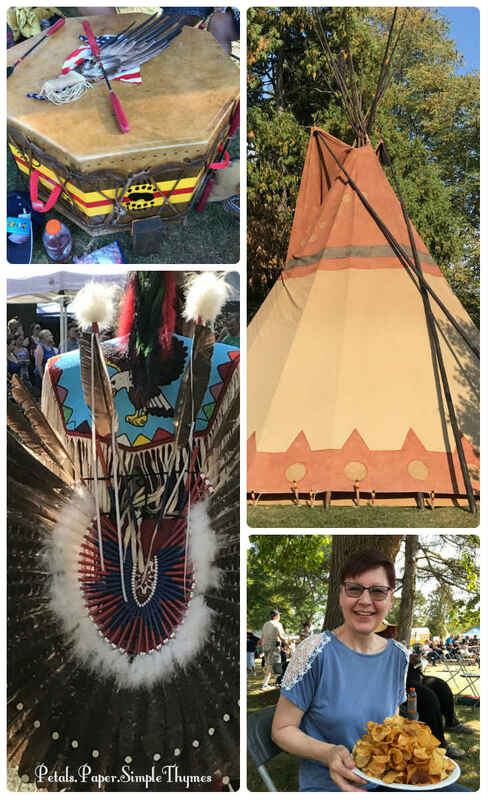 When I look back on our 2017 visit, I will always remember three special sounds: the clip-clop of the Amish horse and buggies, the call of the drums at the Harvest Pow-Wow, and laughter… so much laughter! Our time together just overflowed with happiness and hugs! As always, our visit flew by much too quickly. Of course, we didn’t say, “Goodbye.” Instead I promised, “Bis bald.” (“See you soon!”) Our next adventure might happen here, there, or somewhere in between. 🙂 🙂 Dear friends, together again! Heartfelt thanks for taking the time to visit today! 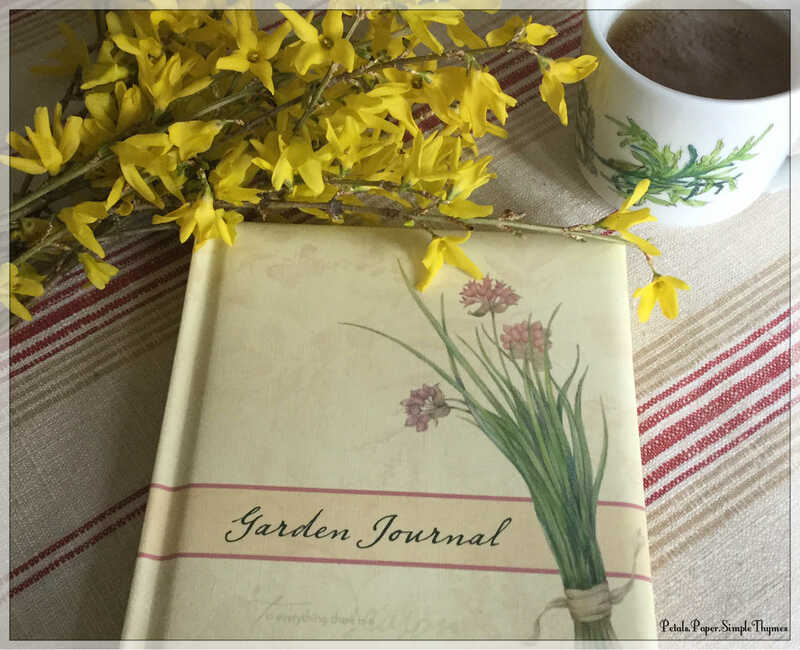 It has been very quiet here on our blog for several weeks now. With everything happening in America and beyond, it felt kind of trivial to share my words. Unbelievable wildfires, the destruction caused by Hurricanes Harvey, Irma, Jose, Maria, and now Nate, a devastating earthquake in Mexico,… and then the heartbreaking gun violence in Las Vegas. Long ago, I experienced the dangers of Nature’s fury. I do know how it feels to have one’s life unexpectedly turned upside down. The effects last long after the clean-up. We cannot forget the people in Texas, Florida, and the islands. They will need our help for a long time as they put their lives back together. If you have been affected by recent storms or are one of the brave first responders, please let us know how you are doing. P.S. This weekend we will celebrate World Cardmaking Day! I’ll be back very soon to share! Delicate blossoms of ‘Cranesbill’ Geranium brighten our perennial borders. Each time the rain stops, a bit of gardenkeeping begins. Everything is growing so quickly! 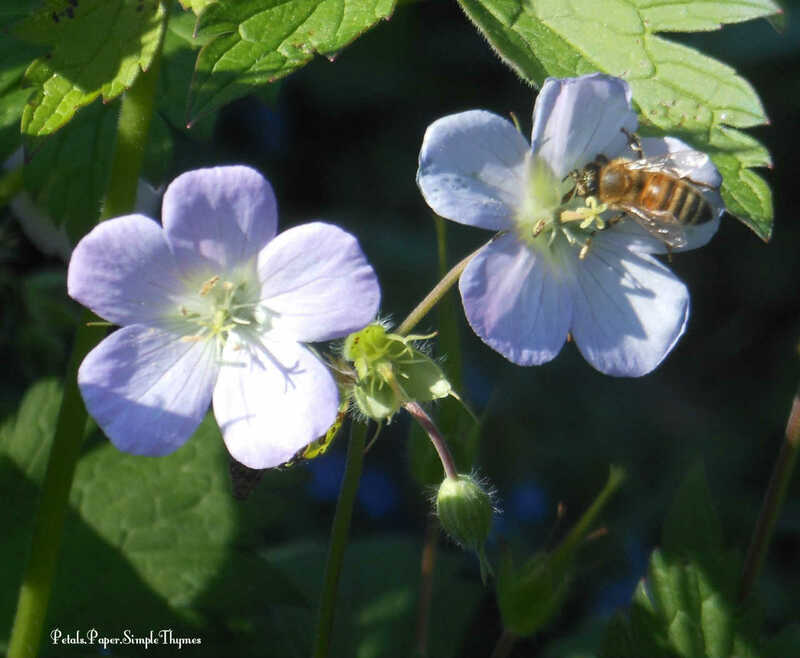 The pollinators have already been very busy doing their important work in the garden. The bee baths are collecting rainwater and encouraging the bees to stay in our garden, rather than leaving to find fresh drinking water. 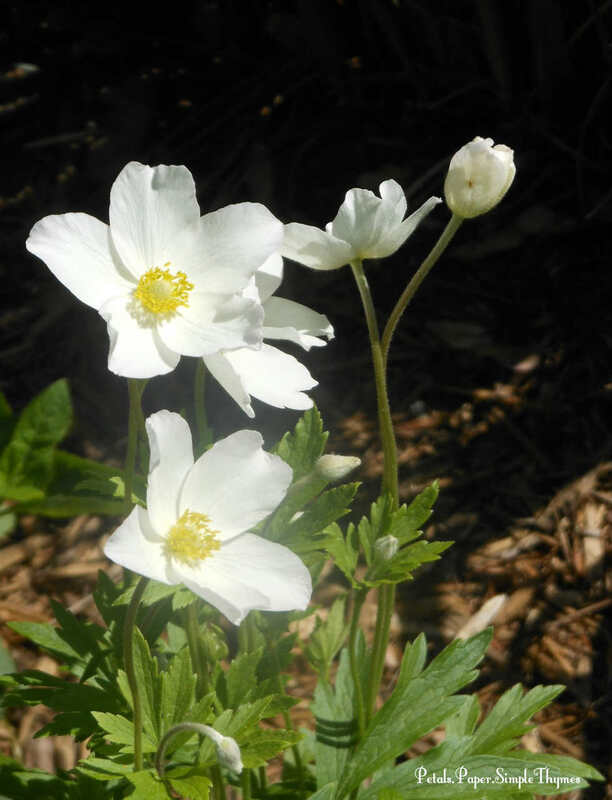 I have been dividing clumps of Spring blooming Anemones in our Friendship Garden bed. 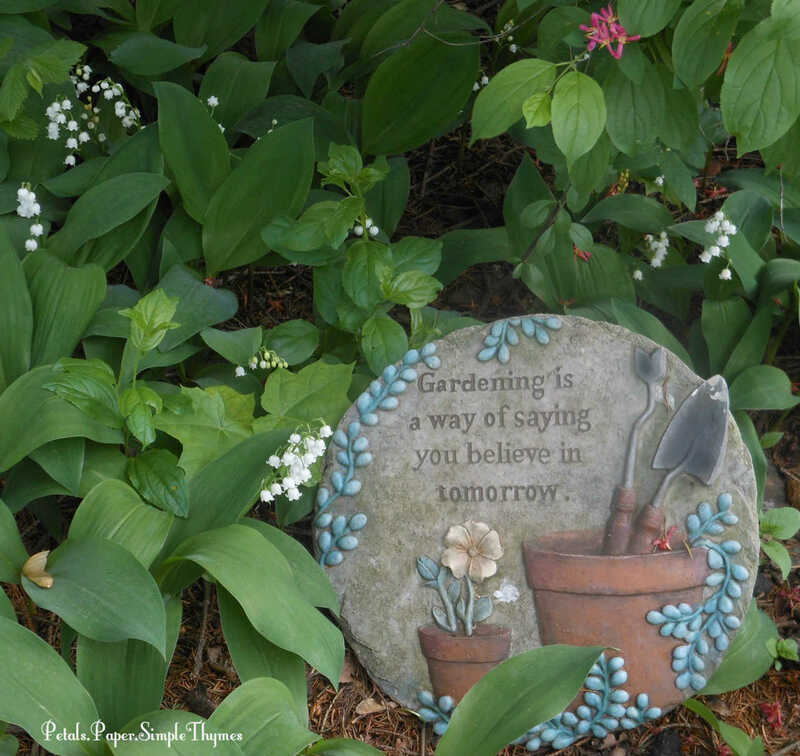 Our Friendship Garden bed always beckons me first when gardening season begins. 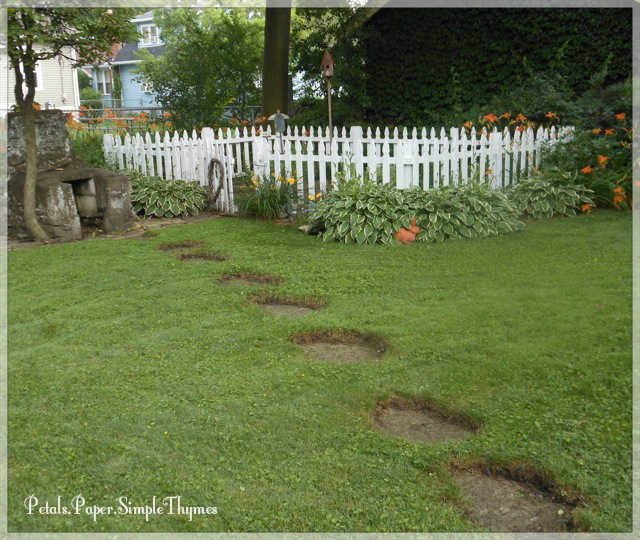 As I work, I try to watch my step, hoping to prevent some soil compaction in the wet, fragile earth. The ‘perennial’ chore of digging up invasive Bishop’s Weed seems endless in our garden. I divided several perennials before adding a fresh layer of mulch to this large backyard bed. Very soon, this special flower bed will be all abloom in the colors of Springtime! 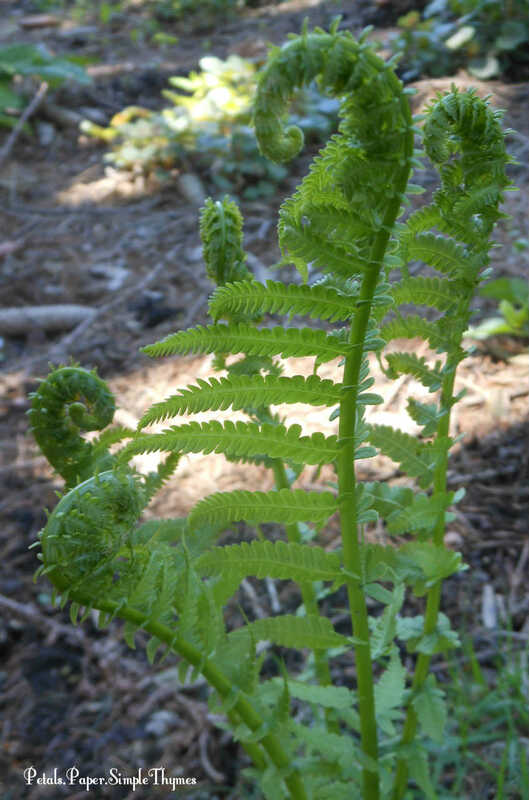 Ferns unfurl in our Woodland bed, beneath the towering pine trees. The additional moisture this season has encouraged the ferns and hostas to unfurl so quickly! We have an abundance of small ferns this year. This week, I transplanted a few into pots for the front porch. It’s a bit of ‘trial and error’ research! Have you had success transplanting ferns into containers? A few years ago, I transplanted hostas into containers with great success. 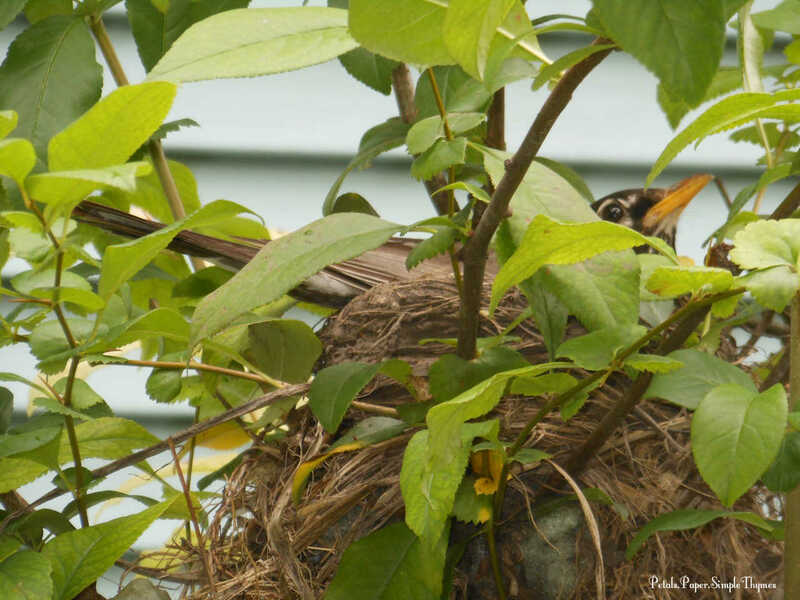 They thrive on our shady front porch and overwinter easily in our unheated garage. I’m so curious to see if the potted ferns will be just as happy and content! Lily of the Valley add their heady fragrance to the Woodland garden bed. The month of May has always been my favorite time in the garden. It’s truly enchanting to see lush foliage, pops of color, and swelling buds that seem to change daily! May holds the promise of all the months yet to come. I have been mowing the lawn often and digging up dandelions, too. Today as I worked, the first peony opened its petals. A short time later, the first ‘he loves me’ Daisy bloomed. 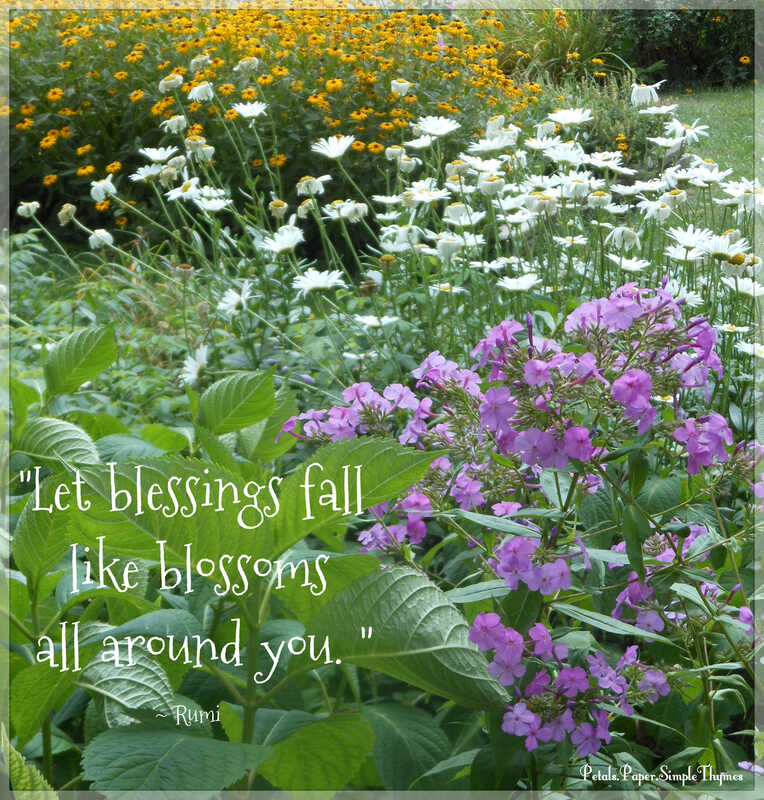 It’s always fun to reward all of my hard work by picking bouquets of blossoms! It was a treat to fill a stoneware crock with Lilacs for the front porch last week. Yesterday I filled a small, pink vase with Bleeding Hearts and Lily of the Valley to bring a bit of Springtime inside. 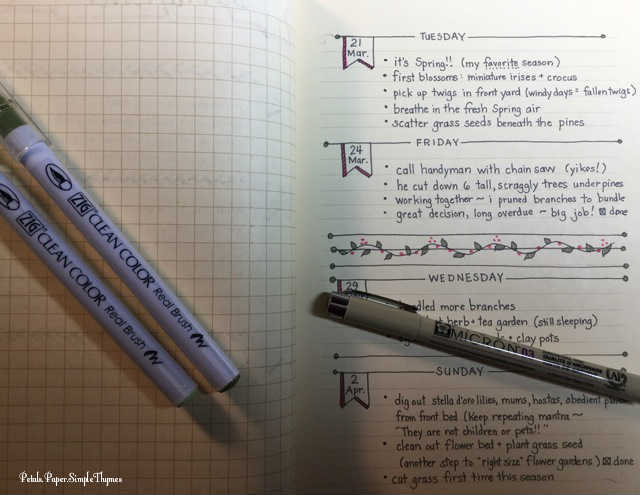 It’s the little things that make life so sweet! 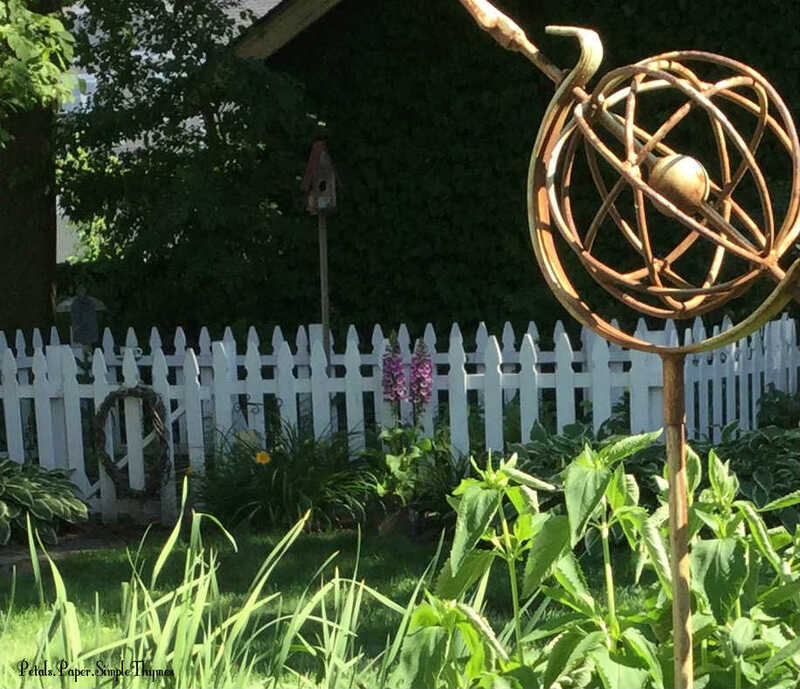 After mid-May, I look forward to planting some new additions in our Friendship Garden. 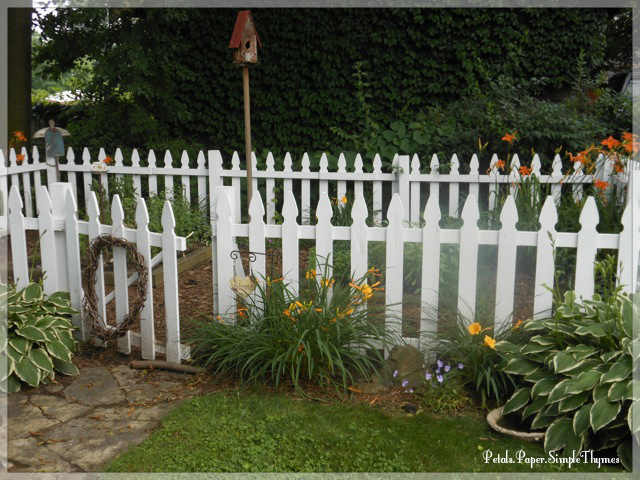 Hyacinth bean vines will climb a trellis and historic Western Jacob’s Ladder will grow along our white picket fence. There is also a new addition for our Herb Garden. For the very first time, we hope to grow our own Red Kuri pumpkins for our favorite Autumn soup. Next week, it will be time to fill containers with colorful annuals, too. This weekend, our nighttime temperatures will drop into the 30s. So, I’m trying so hard to patiently wait… just a few more days! 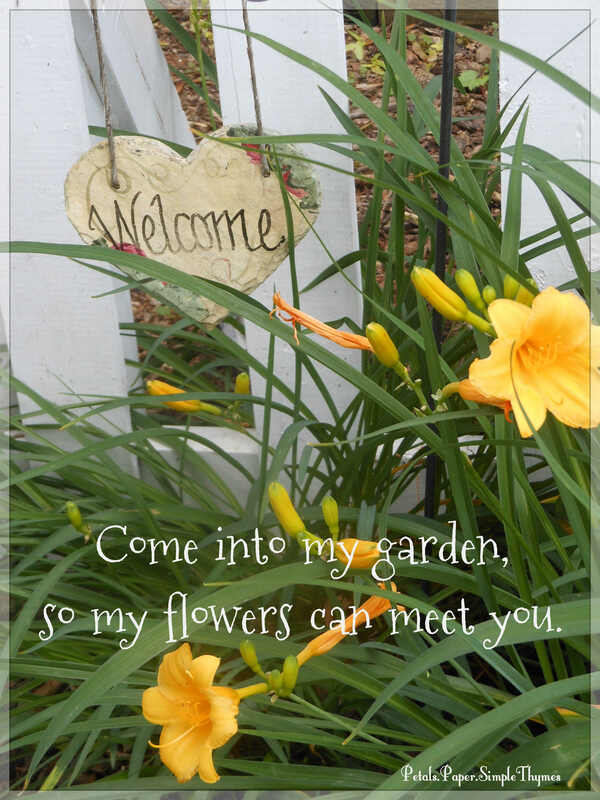 I’m so happy that you stopped to chat by the garden gate today! P.S. 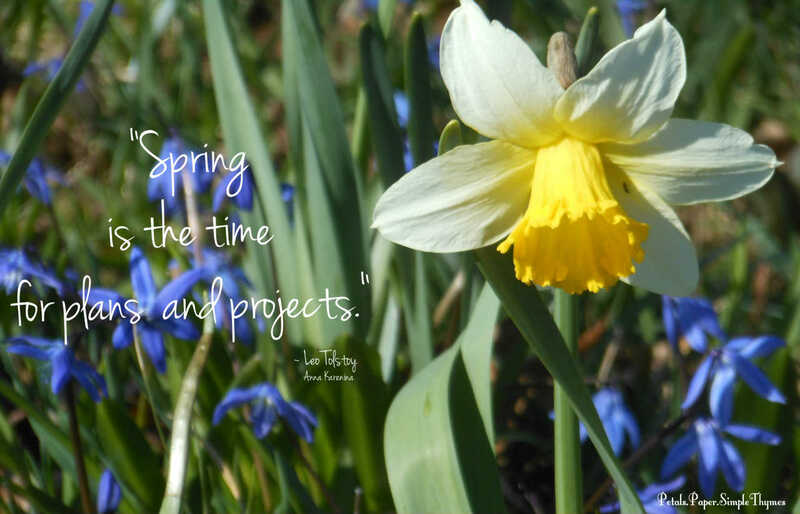 What flowers are blooming in your garden this week? 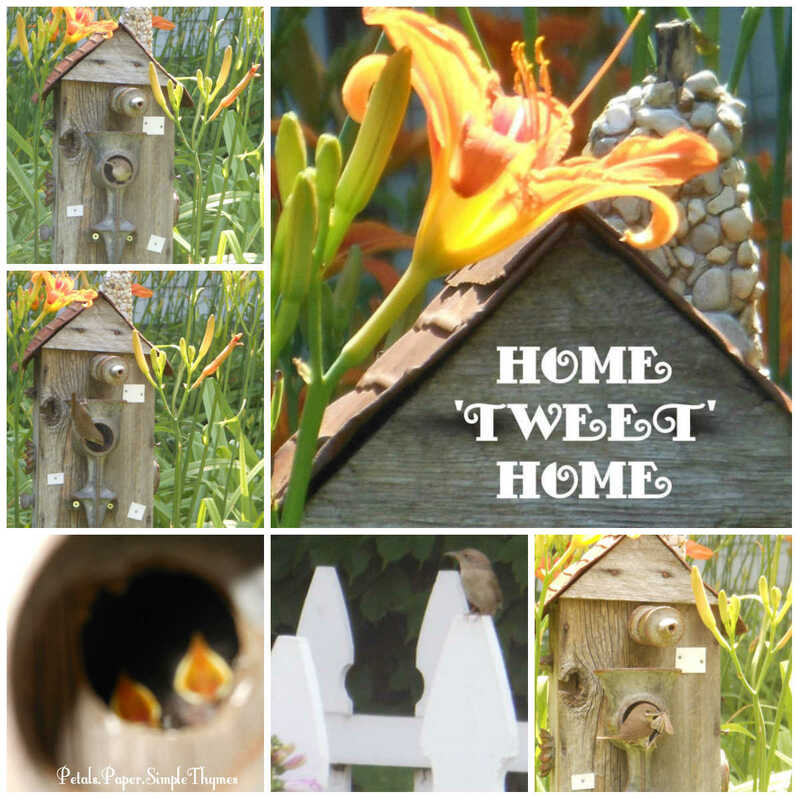 buzzing bees, singing cicadas, and colorful butterflies fluttering about. Gardenkeeping was on my agenda today. 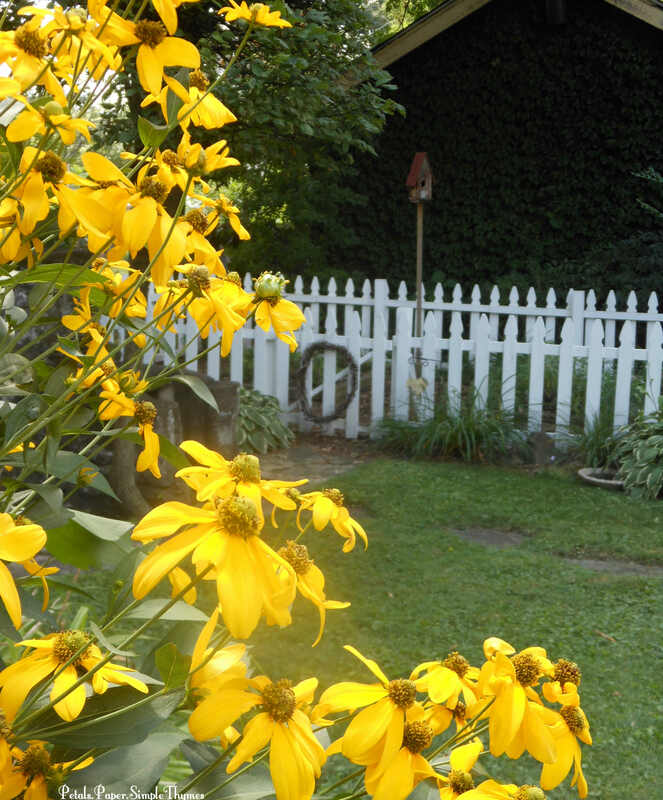 Bright yellow highlights our Friendship Garden this month. Rainy days in June helped the ‘Herbstsonne’ shining coneflower (Rudbeckia nitida ‘Herbstsonne’) grow taller than it ever has grown before! 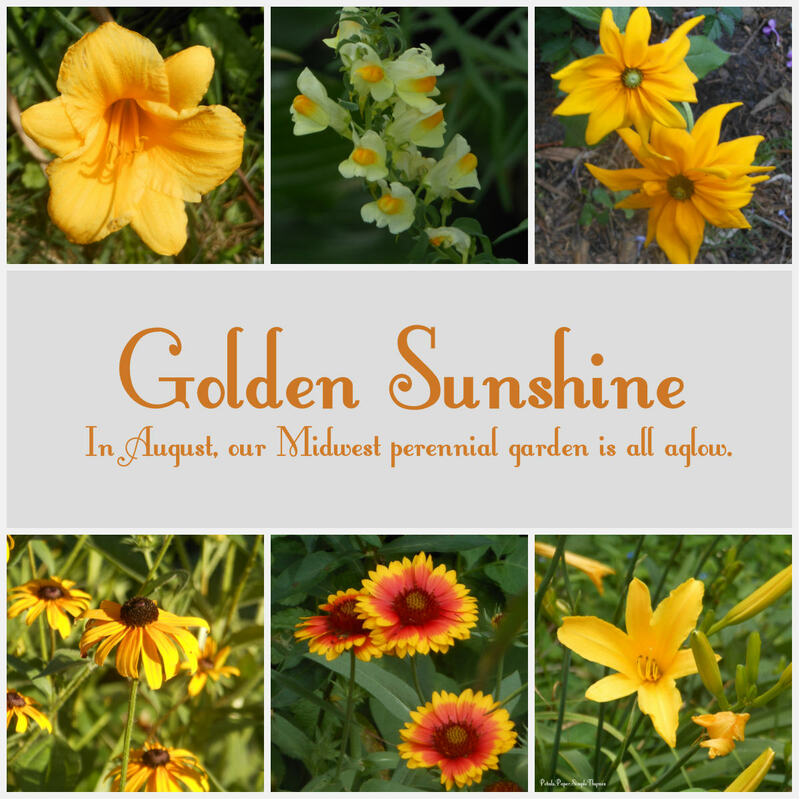 Bright patches of yellow add sunshine throughout the entire garden in August. with shades of purple and pink. and carry it with you wherever you go! My flowers were so happy to meet you! P.S. 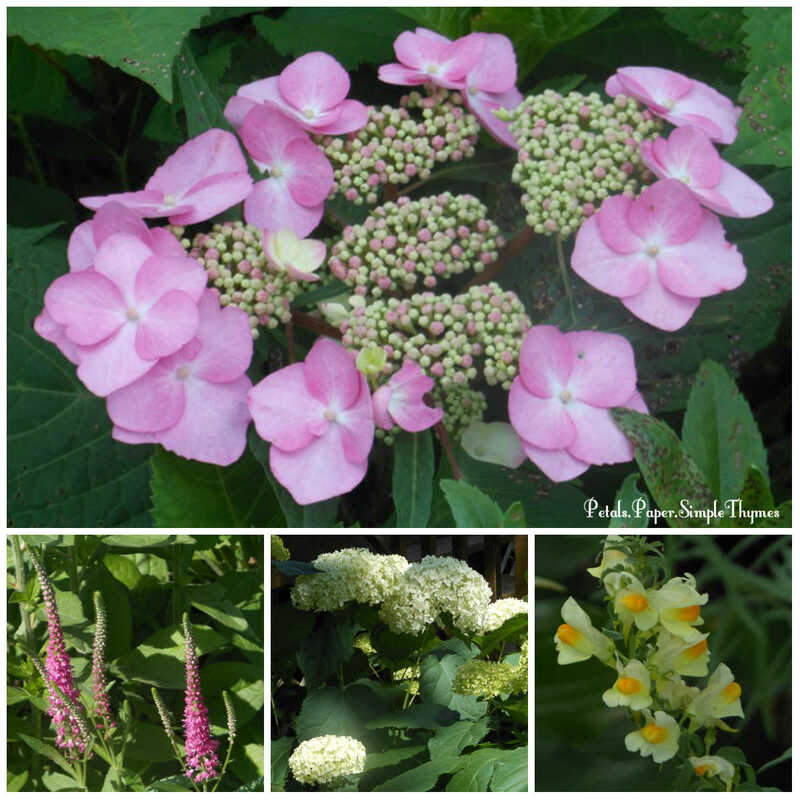 What color really stands out in your garden this week? 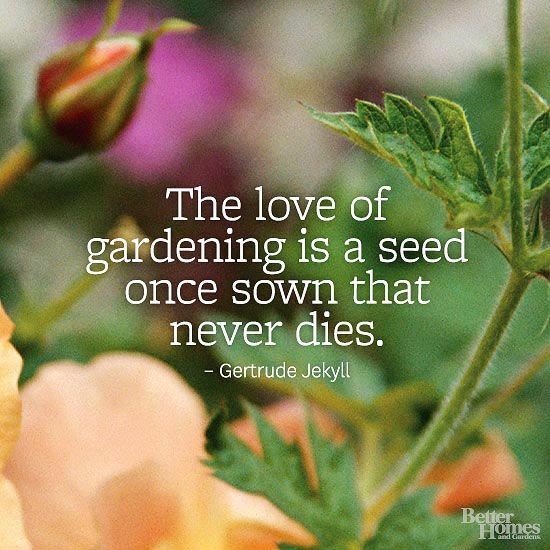 Who helped to plant your love of gardening? It seems like just yesterday! while I was growing up are such sweet memories. the latest issue of Seventeen magazine. 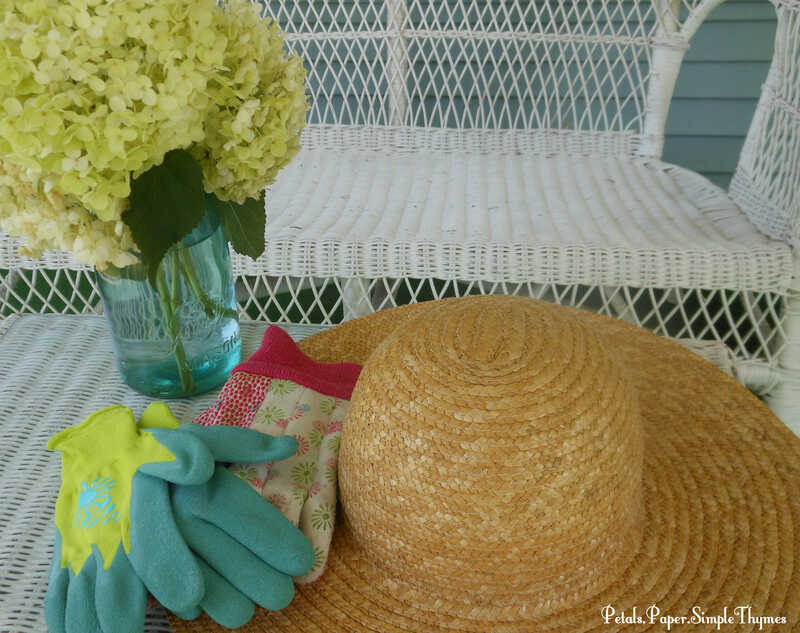 my ‘garden tools’ were a beach towel, radio, Coppertone sunscreen, and sunglasses! sipping iced tea and chatting. and the peaceful feelings found amongst her flowers! and a large yard filled with garden beds. 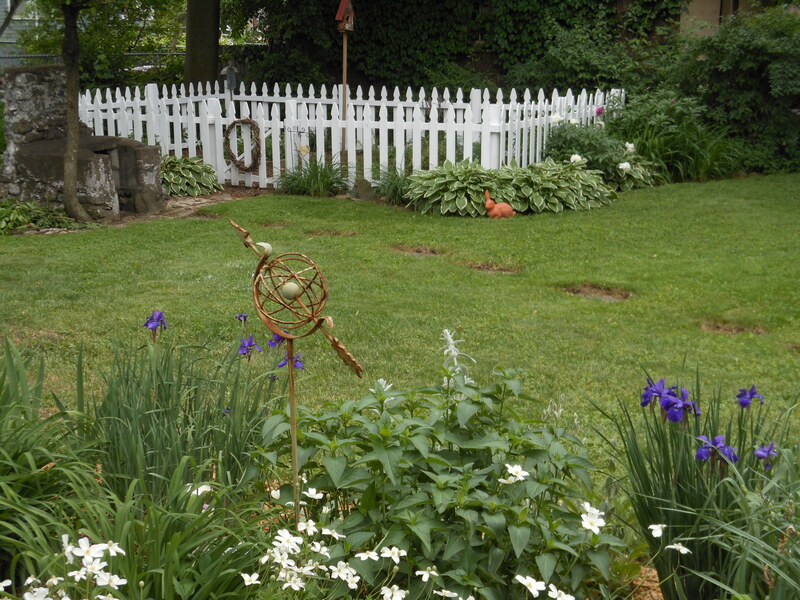 The previous homeowner had planted lovely perennial beds and colorful annual beds. 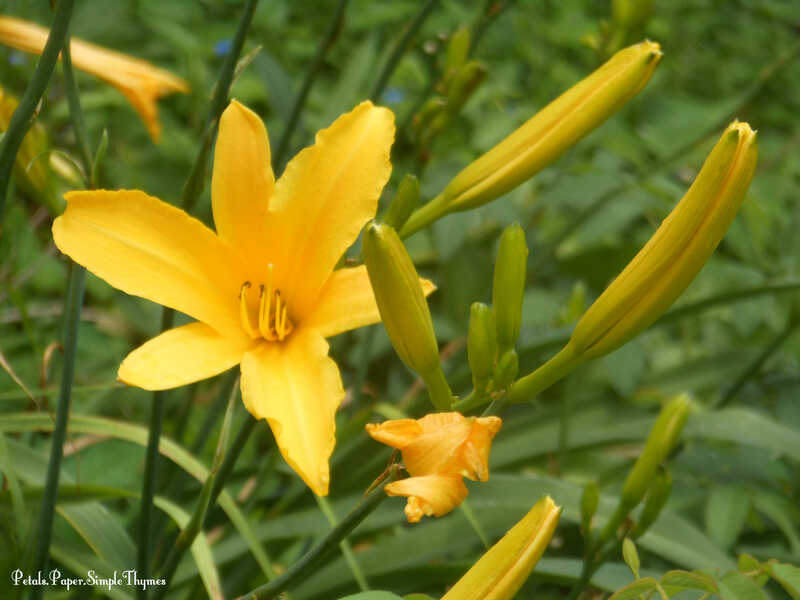 My yard was filled with day lilies, still blooming almost thirty years later! 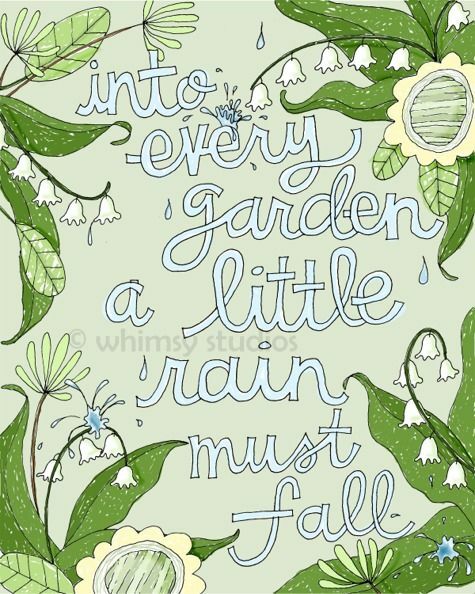 So, I happily watered everything in my garden each day! helping to make my dreams come true. and my mom and I would garden together. 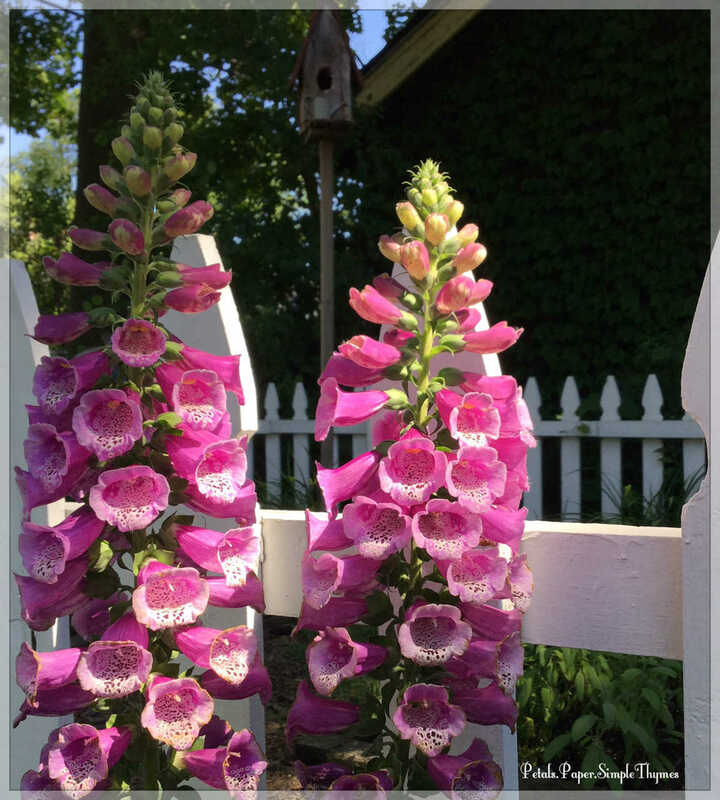 Each weekend, Mom would point out the weeds and the flowers. There was so much to learn!! and deadhead the spent blossoms. 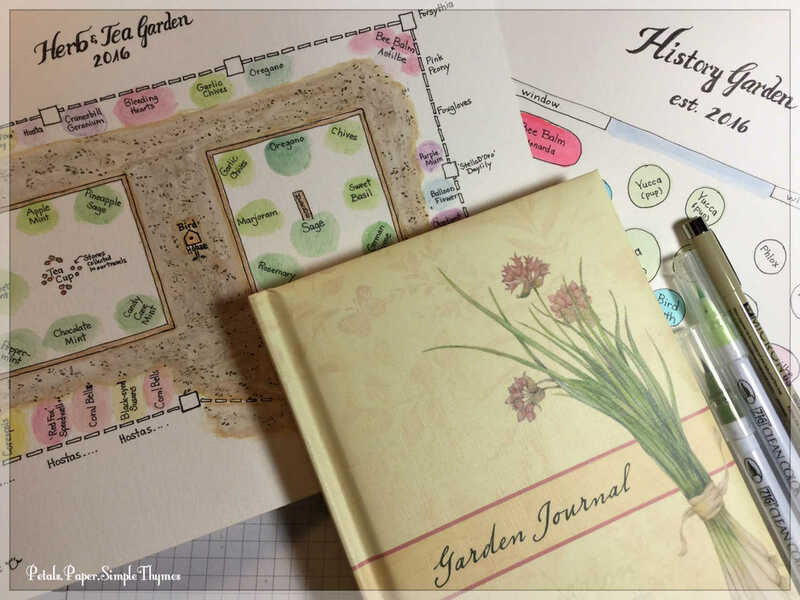 With Mom’s tender guidance, I grew more passionate about gardening with each passing year! returning to the original charm of its 1922 roots. with the love and help of my incredible parents. 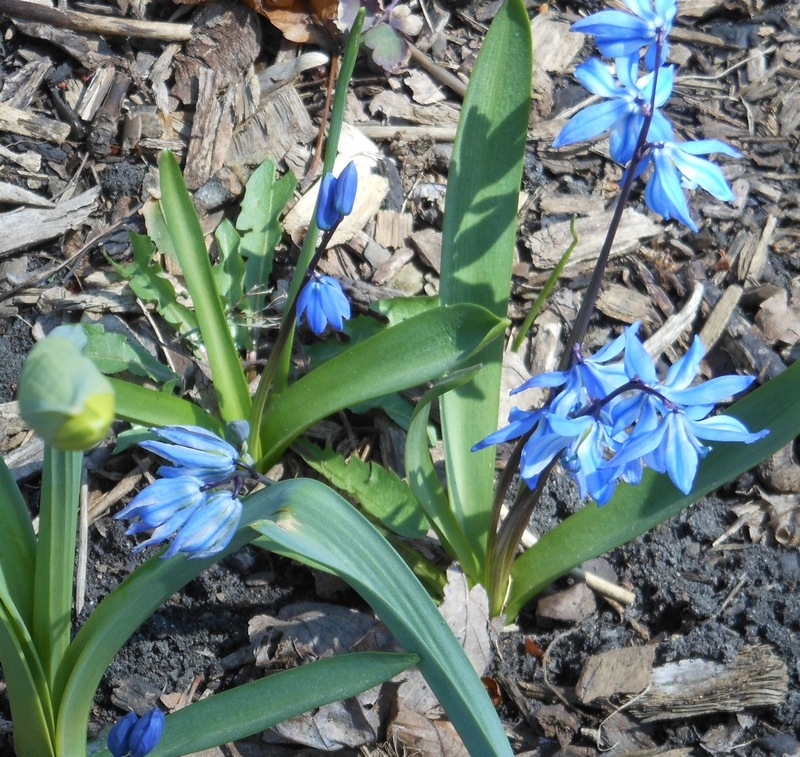 I planted new perennial beds ~ a Friendship Garden and Cutting Garden. 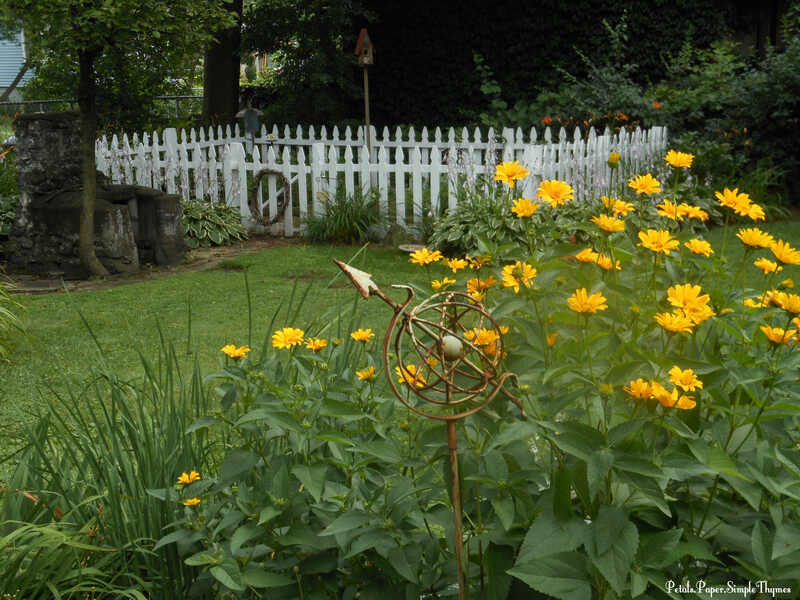 My dad and I worked together one summer long ago, to build my Herb & Tea Garden and an arbor. 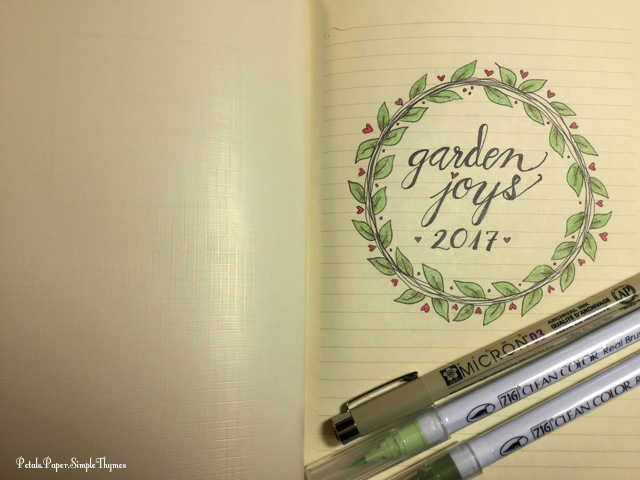 just like the plants in my garden! cacti, succulents, and desert wildflowers. 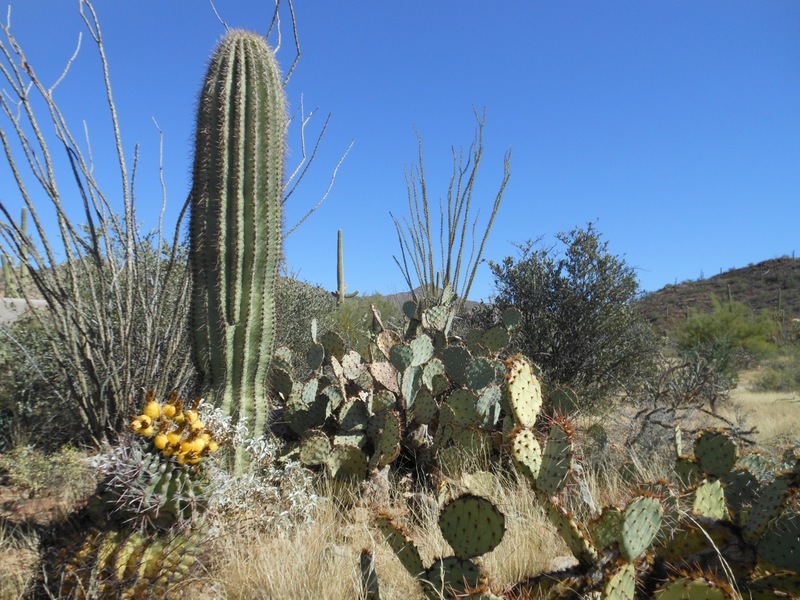 When we hike in the desert or walk through the neighborhood, there is always so much to learn about the plants of the Southwest! Playing in the garden together last week! with me over so many years! 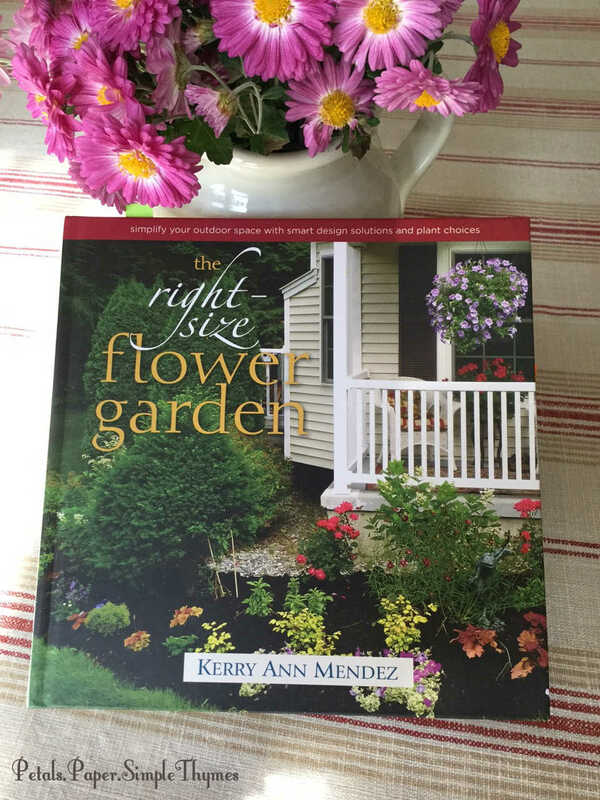 Heartfelt thanks, Mom, for helping my garden dreams come true! 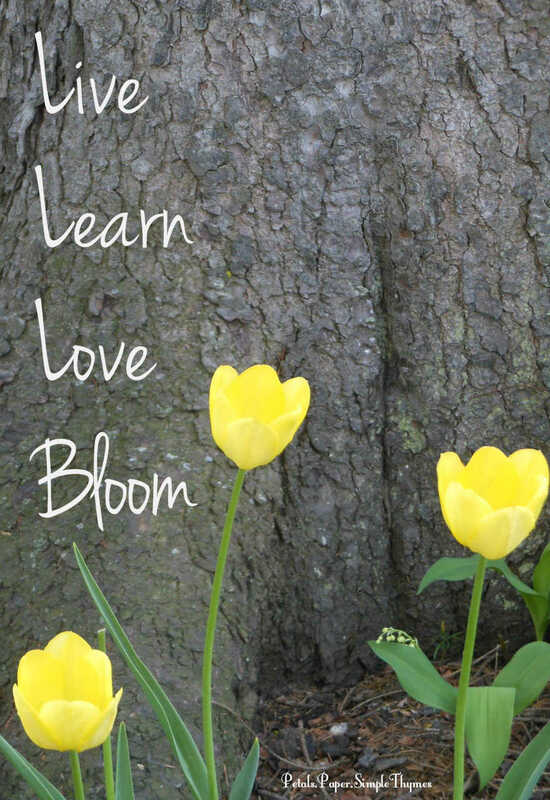 You taught me how to bloom! 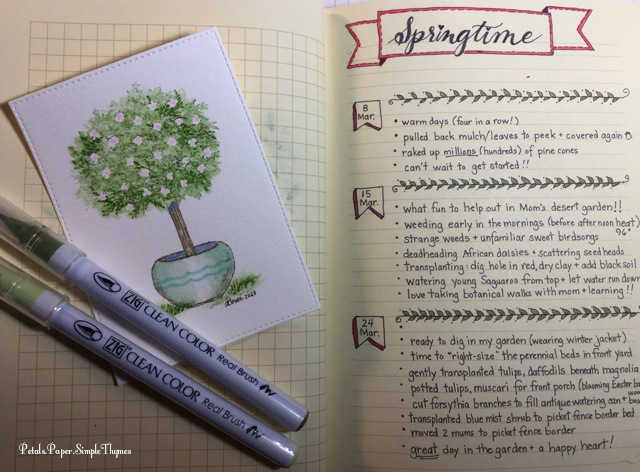 who shared their love of gardening with you? Thanks so much for stopping by today! I always enjoy our visits! 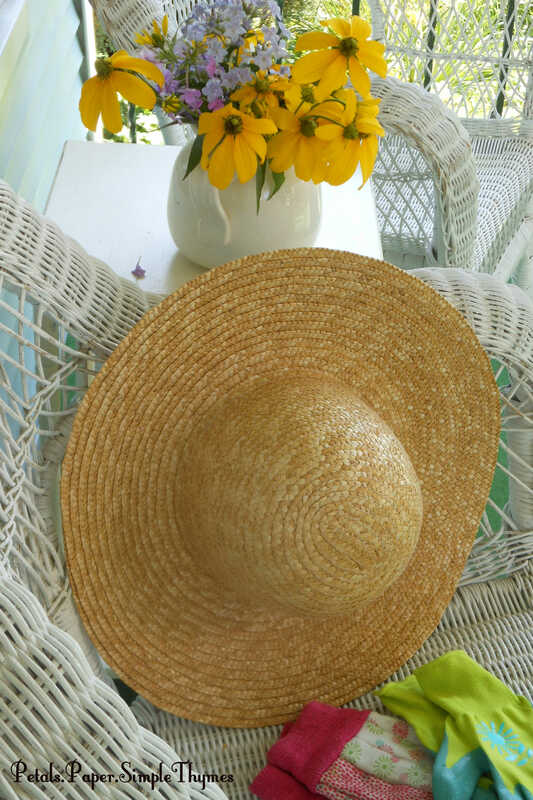 We are oh-so happy that July has arrived in the Midwest with bright, sunny skies! We really need a little sunshine! Our weather in June made the record books. It was our cloudiest June in 122 years and the fourth wettest June in Illinois history. Last month our area had eight inches of rainfall (twice the average June rainfall) and some areas south of Chicagoland had fifteen inches of rain. Roads flooded and rivers overflowed their banks. One terrible night, nine devastating tornadoes ripped through rural communities south of Chicago. What a month! Our gardens here are lush and flourishing! 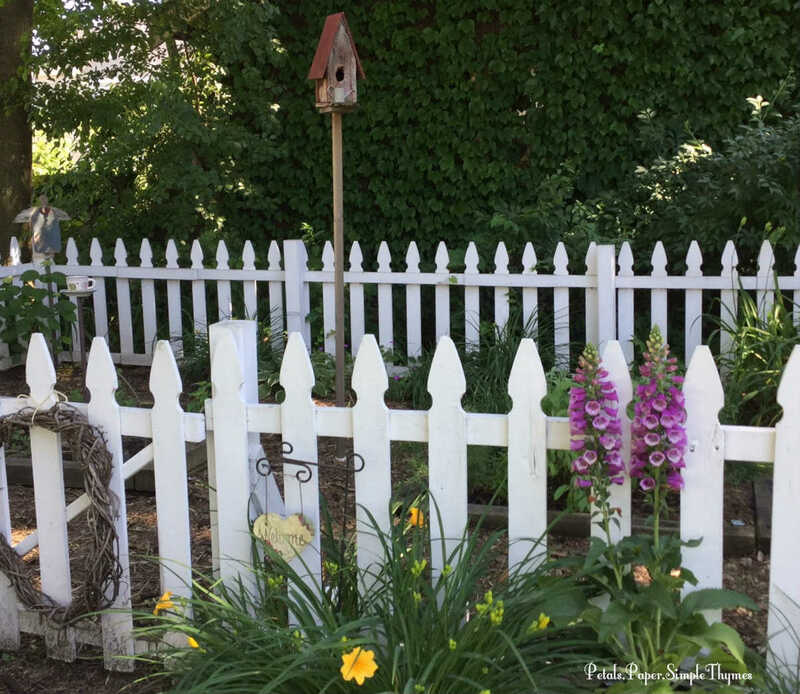 Let’s take a quick walk through the backyard garden today. 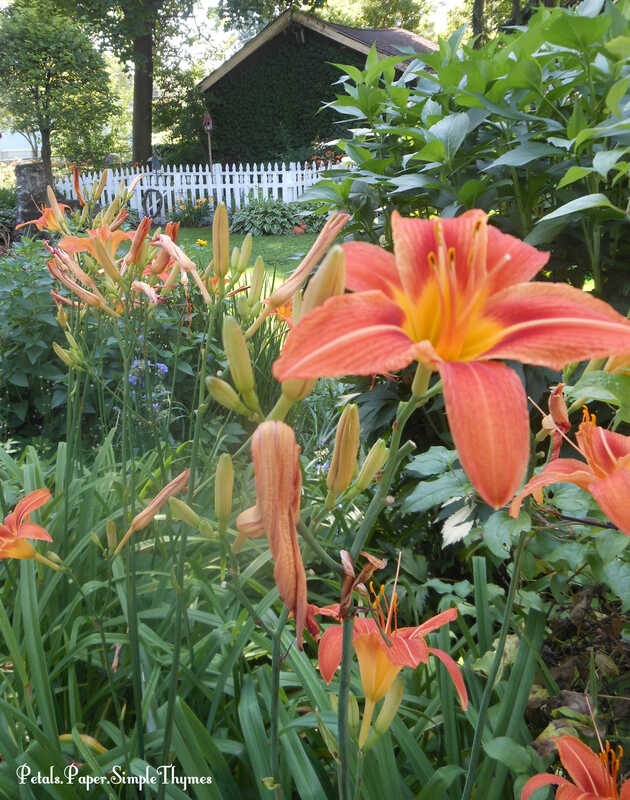 Bright, orange daylilies welcome friends, as we step through the arbor into the garden. 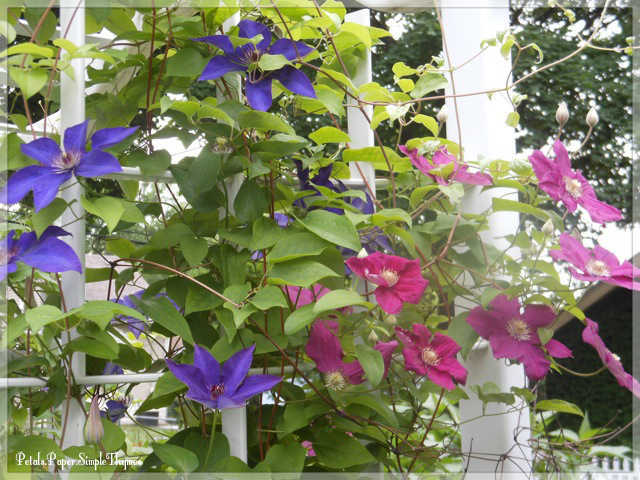 Colorful Clematis blossoms fill the arbor, twisting and climbing all the way over the top. 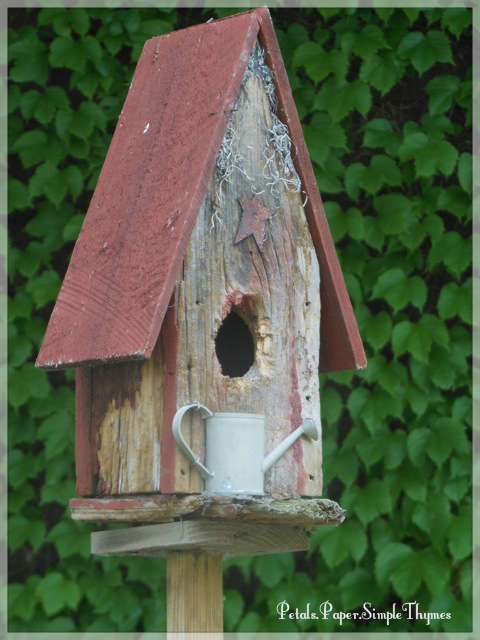 A weathered birdhouse welcomes our feathered friends to the Herb Garden, too. Our backyard is a sea of orange and yellow in late June. 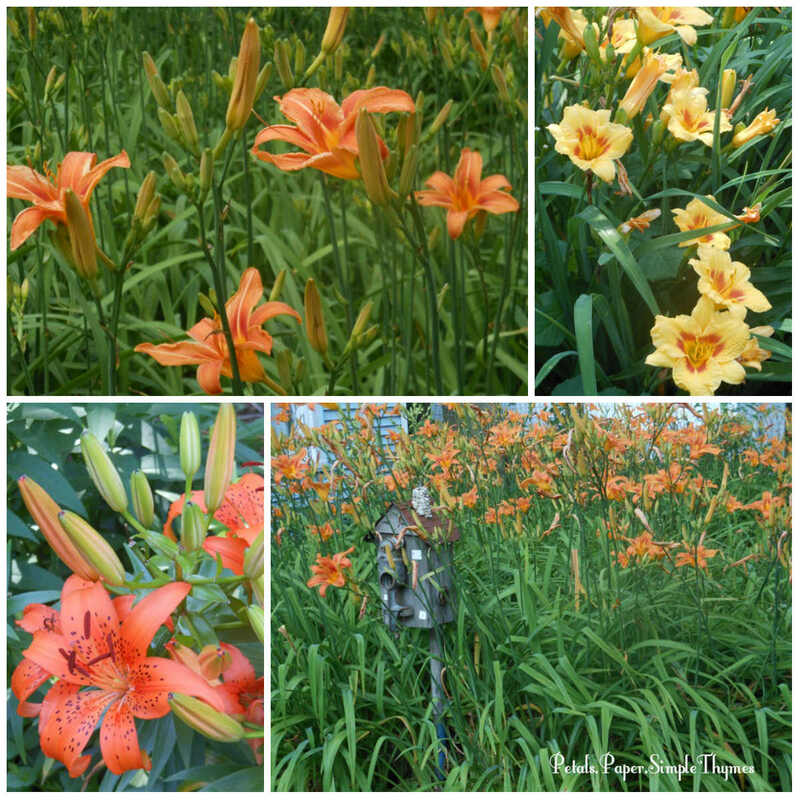 The daylilies bloom just in time for Father’s Day each year. Yellow Stella d’Oro daylilies add color to the Friendship Garden for many weeks. Asiatic lilies show off their blossoms in the Cutting Garden. Pink Lacecap Hydrangeas and white Annabelle Hydrangeas put on a dramatic show with their large blossoms. 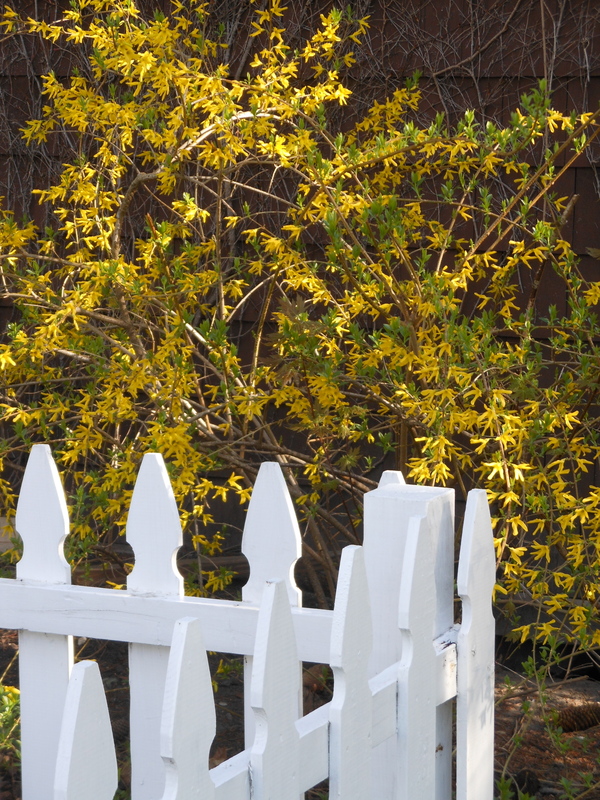 Delicate blossoms add color and interest nearby. 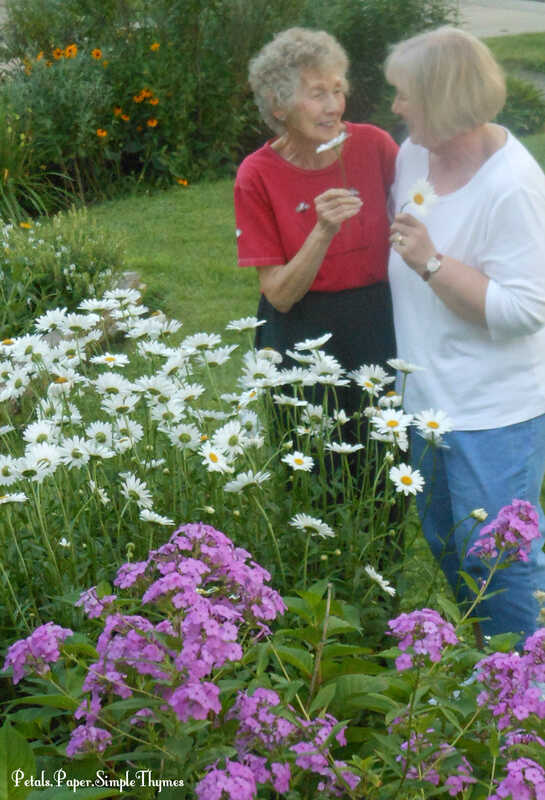 I really wish that we could spend more time enjoying the garden together today. the mosquitoes are flourishing, too! They are biting like piranhas and are really attracted to me. in the United States this summer. 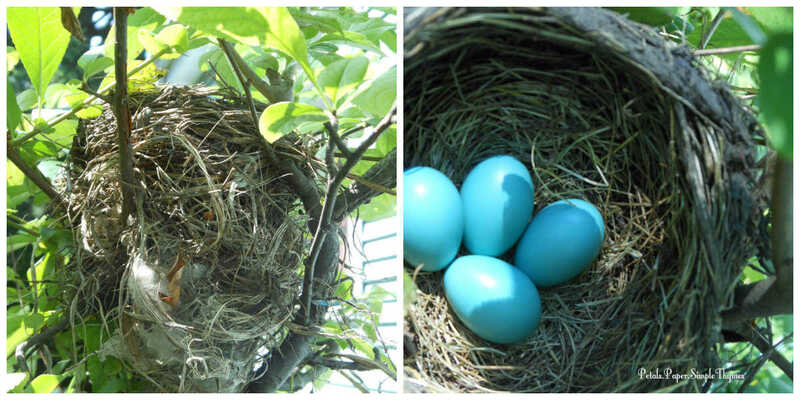 This week, as new broods of mosquitoes hatch, they are chasing me from the garden. but still get bitten, and my face is covered with bites. my hands are covered with bites. In addition to the discomfort, the bites can be dangerous. Mosquitoes can carry West Nile virus and Chikungunya, a newer mosquito-borne virus. from birdbaths and bee baths in the garden. Citronella, Marigolds, Lavender, and Catnip. The Basil and Lemon Balm in our Herb Garden are said to repel insects, too. will be a necessary item on our shopping list. 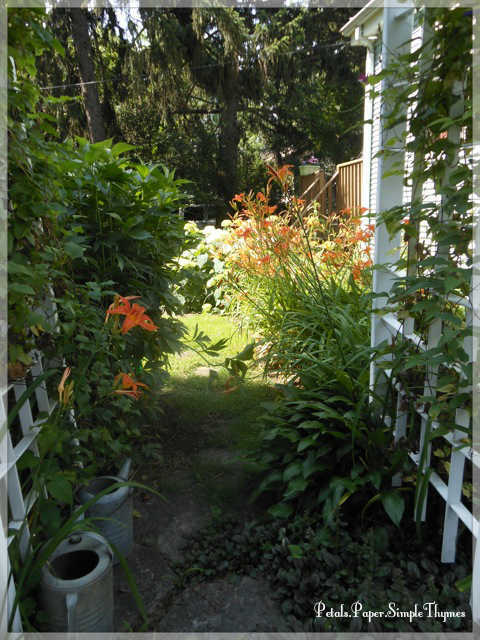 I still dream of lingering in the garden on summer afternoons. Yet this is becoming a very challenging gardening season!